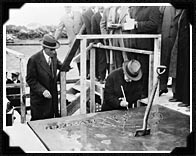 In a touching tribute in 1929 - the 50th anniversary of the light bulb - Edison's friend Henry Ford dedicated a museum complex at Dearborn, Michigan, as the Edison Institute (now known as the Henry Ford Museum and Greenfield Village). It included the complete Menlo Park laboratory, reconstructed in part out of surviving material. In attendance were notables from all areas of American life. 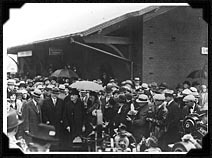 Visibly weak at the Dearborn celebration, Edison said, "I am tired of all the glory, I want to get back to work." He did return to his rubber experiments, but only sporadically. The end came quietly, two years later, on October 18, 1931, at the age of 84. Edison had thought that he could extrapolate from his earlier years in plotting his life after forty. But he did not foresee the changes in the world around him, or changes in his own personal needs. Still, he probably had few regrets. As he said shortly after he had lost several years of effort and over two million dollars in his iron-ore extraction process, he had "a hell of a good time." 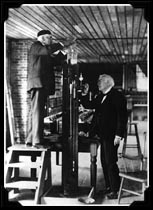 Edison and Francis Jehl reenact the evacuation of an experimental light bulb in the reconstructed Menlo Park laboratory at Dearborn.